hen my eyes were drawn to the mountains across the way. Red splashes like watercolor brush strokes climbing a mottled green canvas were shinning from the forests. 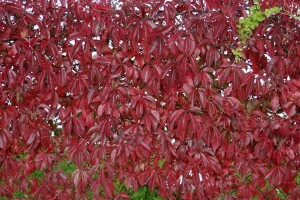 It was Virginia creeper ablaze in autumn splendor. The hues ran from yellowish-orange to a deep burgundy-red – and a lot of really bright red. Virginia creeper, Parthenocissus quinquefolia, is a deciduous climbing vine that can reach dizzying heights. It is native to eastern and central North America growing from Canada all the way south to Mexico and Guatemala. It grows as far west as Manitoba in Canada and South Dakota, Utah and Texas in the U.S. Parthenocissus is from the Greek and means virgin ivy while quinquefolia refers to the palmately (five leaflets) compound leaf. or and its appeal to a variety of wildlife. More than 25 species of birds utilize the dark blue/black berries that ripen in the fall and stay on the vine into winter. Chipmunks, mice and skunks will also feed on the berries while white-tailed deer will browse the foliage and twigs. Conventional gardeners like the color as well plus the fast growing, climbing habit. It is used on trellis and to accentuate borders along fences and even ivy-like on structures. The creeper, like ivy, does not root into structures but affixes itself by small strongly adhesive pads found at the tips of its forked tendrils. ho come into contact with it. 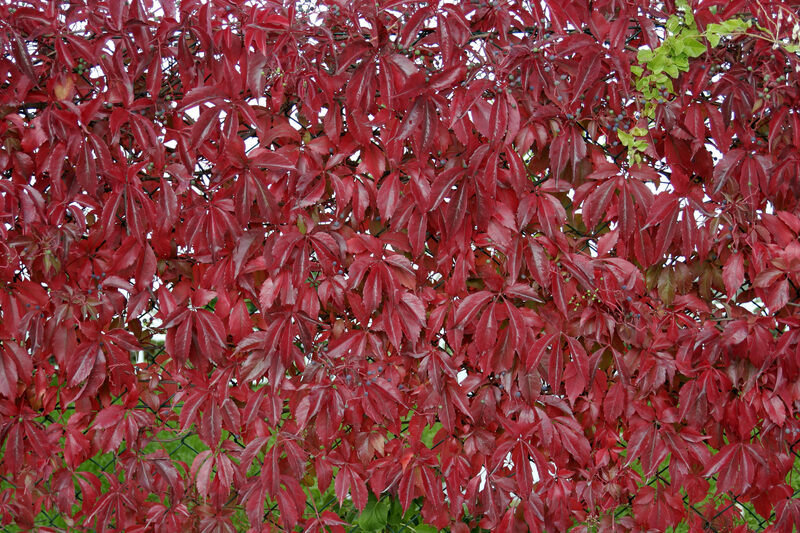 Virginia creeper contains oxalate crystals and can cause a rash in certain people who are susceptible. And the berries of poison ivy are white rather than blue-black. The fast growing nature of Virginia creeper means you have to keep an eye on it in your garden/landscape in order to keep it where you want it. The young vines are easy to pull up by hand. In the forest it can sometimes suffocate small trees but larger trees seem to tolerate it okay. It doesn’t appear to be as troublesome in natural settings as wild grapevine and nothing like kudzu or other non-native invasives. It appears to be a quite natural component of most eastern forests and a beautiful one at that – especially in autumn.